Lake Lugano is situated in the south east part of Switzerland and is located on the Switzerland and Italy border, most of Lake Lugano lies in Switzerland, the lake is named after the city of Lugano that is situated between Lago di Como and Lago Maggiore. The two lakes, Lake Como and Lake Maggiore cover a much larger area that Lake Lugano, the most interesting feature of Lake Lugano is it's shape, it's a long lake about 36 kilometres in length but the width of the lake does not exceed more than 2 kilometres at any point, also Lake Lugano is the only lake that has a bridge over it that connects the two towns Melide and Bisonne. Lake Lugano is surrounded by beautiful hills and mountains, the area experiences a climate close to that of the Mediterranean climate, the beautiful mountains, surrounding villages and towns together make Lake Lugano the perfect holiday destination. 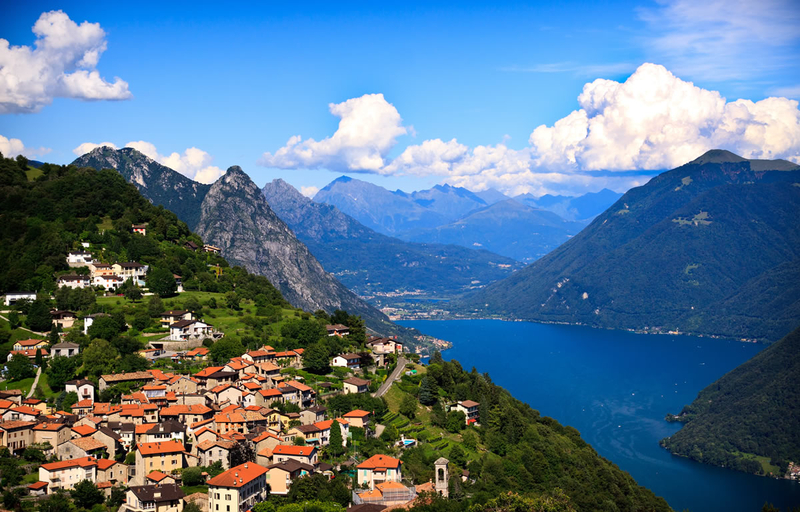 Some of the interesting mountain peaks to visit near Lake Lugano include Monte Bre and Monte San Salvatore, Monte Bre is the closest to Lugano and is about 925 meters high, the mountain stretches over the border of Switzerland and into Italy. Tourists can enjoy beautiful views of Lugano at the kale and the surrounding mountains, you can reach the mountain by the funicular railway, Monte San Salvatore is another surrounding mountain peak and is about 912 meters high, this mountain too can be reached by the funicular railway which starts from Lugano Paradiso. Monte Generoso is a favourite tourist destination near Lake Lugano, the mountain is 1,701 meters high and is located on the south east shore of Lake Lugano. The Museo Cantonale d'Arte is a must visit place for art lovers, the museum has beautiful paintings by Dugas, Klee, Renoir, Jawlensky and many other great artists, the Hesse Museum in Montagnola is an interesting place to visit for music lovers. April to June is the best time to visit Lugano, during this time the town is buzzing with activity and enjoyment of the Lugano festival, all through the festival evening concerts are held, famous directors and soloists from all over the world attend the festival and participate in the concerts. June to July is the time of the Jazz Festival of Lugano. In July there is the Campione d'Italia Fireworks display in the small Italian enclave of Campione, Campione is situated on the southern shore of Lake Lugano and there are special boat cruises from Lugano to view the spectacular site from the water. An annual car show and auto exhibition called Auto Nassa is held in May every year, people attend the show at the Via Nassa shopping district in Lugano. If you're specifically looking for pet & dog friendly apartments, villas & holiday rentals in Lake Lugano or Italy, please visit our Italian Lake Collection on Passpawt. Among the various towns near Lake Lugano, Lugano and Gandria are a must visit, Lugano has a beautiful view of the Alps and Dolomites,while your in Lugano it's worth visiting the historical art museum, Museo d'Arte which is located in Villa Ciani which is an 18th century mansion in the town of Lugano. The town of Gandria on the other hand is one of the most picturesque places to visit near Lake Lugano, the Swiss Customs Museum is an interesting place, the museum throws light on the various issues like illegal trade of endangered species, smuggling that custom officers have to deal with, the museum is also popularly known as the Smugglers Museum, the Swiss Customs Museum is open in the afternoon from mid April to October. Campione d' Italia is a small Italian town surrounded by Switzerland on all sides, the mountains and Lake Lugano separate the town from the rest of Italy, when visiting this town you can see the church of S. Maria dei Ghirli, this church is connected to the lake by a stairway that is surrounded by cypress trees, the church has beautiful frescoes dating back to the 14th century. Wandering around the church area you can also see the boarder markers that define the boundary of Italy and Switzerland, the town of Campione d' Italia is also known for it's casino, the casino was designed by a local born architect, Mario Botta, visitors from all over like to visit this casino. The villages near Lake Lugano are very beautiful, Morcote is a picturesque village situated along the side of lake Lugano, the village is known not only for it's scenic beauty but also for it's antique shops that overlook the lake. The village has beautiful buildings and churches that date back to the 16th century, the Church of Santa Maria del Sasso for instance has beautiful frescoes, other architectural sites date back to the 16th century, for those who are interested in visiting the Greek and Egyptian temples the Scherrer Monument Park is the place to visit and is half a mile from the main town. The nightlife near Lake Lugano is equally good, with two casinos and daily cruises in the summer, you can also relax and enjoy a movie in one of the cinemas in the area. Reaching Lake Lugano is quite easy as the whole area is well connected with the surrounding villages and towns, Lugano has it's own airport where there are daily flights from Zurich and Geneva, Lugano is 220 km from Zurich and 445 km from Geneva and is accessible by road and rail too, Lugano is situated on the North South axis of St. Gotthard range making Lugano accessible from all over Europe.